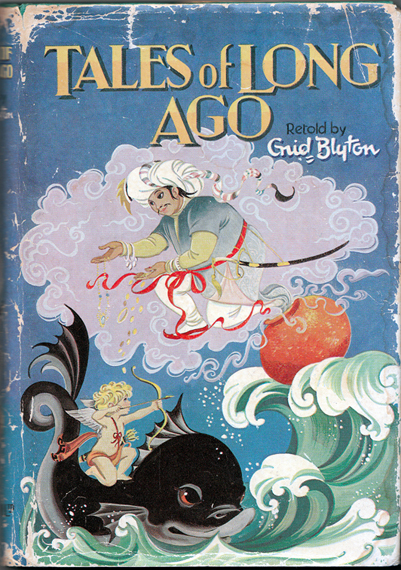 Description: Split into two sections, this lovely tome features a total of 22 magical tales from Greek Mythology and The Arabian Nights. Illustrated throughout with excellent b&w ink drawings by the celebrated Johnstone sisters – many of which are full-page. Teal coloured textured boards with black text embossed on spine. Spine and lower corners lightly bumped. The pictorial jacket is worn and rubbed along the spine and extremities (refer to image), but remains complete. The pages are bordered by heavy tanning, and there are some minor grubby marks on pp. 58-59. Otherwise, all are unmarked and free from foxing. The binding has split slightly in the centre of the book, but all pages remain firmly bound and show no intention of coming loose. Measures 19 cm × 13 cm (7.5″ × 5.2″). Large 12mo. 184 pp.